Virgo September 2016 Horoscope forecasts that planetary strength is located in the lower half of the horoscope near the nadir sign. There is clarity on family issues due to the aspect of Pluto in the 4th House. Your concentration should be on solving the domestic problems and career will be on the sidelines during the month. In September 2016, your confidence and self-worth will be enhanced. Your magnetism will help you to assert yourself. The Virgo personality’s independence will be assisted by courageous decisions and actions. You are sure of your course of life and there will be glory and prosperity at each step. The Lunar Eclipse of September 2016 indicates change of job in the near future for the Virgo zodiac sign. Businessmen will face disturbances from their employees. The Virgo monthly astrology predictions for September 2016 foretell that monetary situation is superb this month and speculative ventures will be profitable. You are not taking undue risks and plenty of thinking goes into your risks. Financial intelligence and instinct are excellent and you have the guidance of your psychic abilities. You will also go by your visions and intuition. The Virgo people will be interested in humanitarian activities and will donate money freely. Your wealth increases enormously towards the end of the month. Planet Jupiter is helping you unlock hidden resources and there will be no dearth of money. Social contacts and planetary positions are conspiring to give you prosperity in September 2016. Virgo, you will buy luxurious items for personal use. You are investing in yourself to enhance your personal image which will boost your earnings. You are able to raise cash easily. Your spouse will assist you in your financial goals. The 2016 September zodiac forecasts for Virgo star sign suggests that single Virgins will have many romantic opportunities this month. They are more for enjoyment and serious partnerships are still far away. The Lunar eclipse will put your existing partnerships on trial. This is not a good time to have a child. Serious and committed Virgo relationships will be blessed. Conflicts with family members are likely. Love will be harmonious towards the end of September 2016. 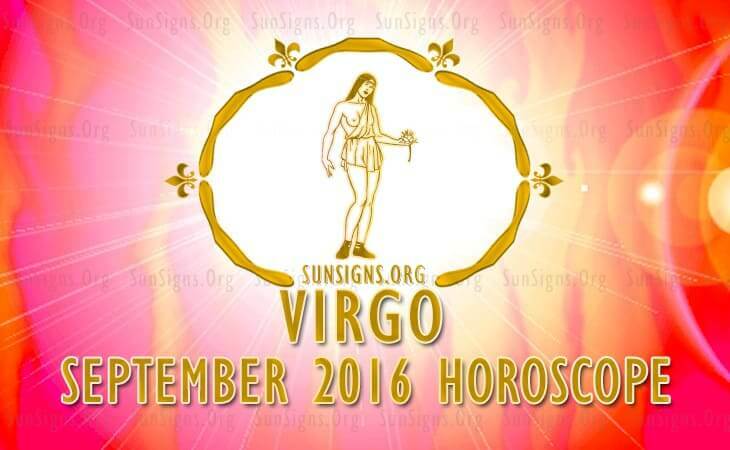 The Virgo health will be normal in September 2016. Your energy level goes up due to planetary influences. Life will be strenuous till the 8th due to professional stress. This may lead to stress hives and increase in appetite. To conclude, the Virgo horoscope for September 2016 forecasts good decision making skills that will help you go far ahead in life.